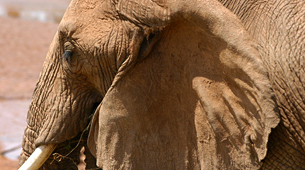 Save The Elephants (STE) was founded by Dr. Iain Douglas-Hamilton. During the 1970s, Dr. Douglas-Hamilton investigated the status of elephants throughout Africa and was the first to alert the world to the ivory poaching holocaust. He chronicled how Africa’s elephant population was halved between 1979 and 1989 and helped bring about the world ivory trade ban. STE operates in every African environment – desert, forest, bushveld and savannah.